A PMO is first and foremost an evolutionary entity. It must be under constant development, and is designed to evolve with the organisation it belongs to, as well as the projects it undertakes. How mature is your PMO? 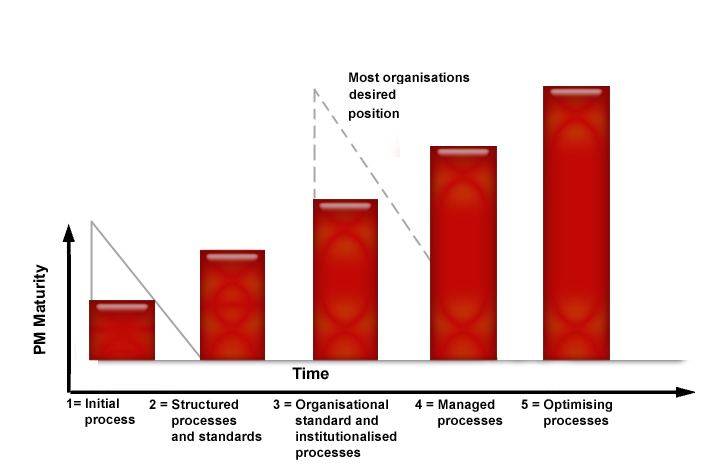 It takes time to establish a successful PMO but those that have been in existence for more than 10 years are highly respected in the organisation and over half (53%) of these established PMOs are perceived as having a strategic value or influence. There’s a direct link between the maturity of the PMO and the value it provides. Mature PMOs are far more likely to offer real competitive advantage to a business by increasing the speed and quality of business returns. In fact, the 2012/13 Project Management Office (PMO) Survey conducted by PM-Partners group showed that 37% of projects ran outside the control of the PMO in those established less than five years. This number dropped to just 10% after 10 years of existence. It was discovered that more than 90% of PMO Managers believe that they have improved their PMO over the past business year. This is reflected in the fact that 75% of PMOs achieve a Level 1 or Level 2 maturity rating within the first five years of existence. The function of the PMO needs to evolve over time, changing with new organisational requirements and trends, and this flexibility can be seen as a strategic advantage to the business. The current top functions that PMO’s are planning to implement in the next two years are expanded benefits realisation, portfolio analysis, and project assurance services. It is also worth noting that over 60% of PMO’s are in the process of obtaining advanced project management software within the next two years, in order to improve resource optimisation and visibility, leading to a much more sophisticated and business wide view of projects. How mature is your PMO? For specialist advice on how to approach and deliver maturity improvements within your PMO contact PM-Partners group. From executing single or multiple projects through to building best practice techniques and capabilities, we work closely with you to drive business results. Our talented team of experienced consultants, project managers and facilitators work with organisations throughout Australia, Asia and Europe. Established for over 17 years, we manage over $1B of client projects across multiple industry sectors and specialist domains and train over 4000 project managers each year.